Milos Sajin teaches Classical Guitar, Flamenco Guitar, Contemporary Guitar encompassing Jazz & Blues Guitar, Electric Guitar (Pop&Rock/Heavy) and Acoustic Guitar (Folk), as well as Music Theory and Composition at the Shine School of Music. The Shine School of Guitar is headed by Milos Sajin. Taught for many years by his father, Strahinja Sajin, Milos went on to study blues and jazz with Tony Russel (South Africa) and flamenco with Rafael Canizares (Cataluna, Spain). He completed his formal Music History Studies at the University of Witwatersrand (Johannesburg) and obtained his Guitar Teaching Qualification with the Associated Board of The Royal Schools of Music (London). 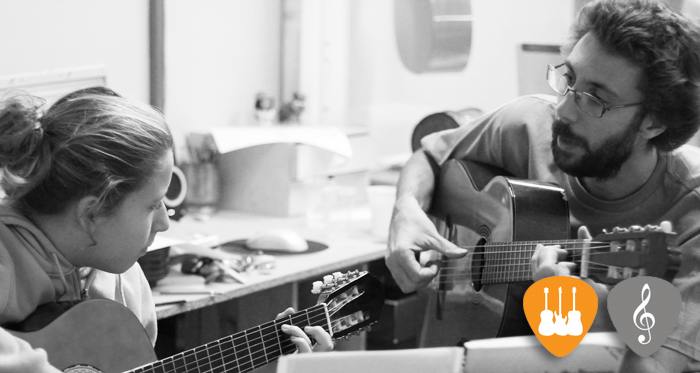 Milos dedicates all his time and efforts to ensure the smooth operation of Shine Music School Barcelona. Under his supervision, the school has become a renowned institution for guitar teaching as well as a center of music learning. With Milos’s wealth of experience as teacher and musician the students of the school have excelled in every field including performance, composition and academics.